St Johnstone have announced that Danny Swanson and Richard Foster have been suspended pending an investigation into their controversial dismissal in the 1-0 defeat at Hamilton. The pair were sent off by referee Don Robertson after clashing with each other seconds after the half-time whistle sounded. Chaos descended on the pitch and around the tunnel area after the two Saints players had to be separated. Both were red-carded inside at the interval, leaving the visitors to play the second half with nine men. A melee ensued following the clash, which resulted in Hamilton assistant Guillaume Beuzelin being sent from the technical area and Accies midfielder Ali Crawford booked. The Perth club issued a statement later in the evening which read: "Following the incident in today's match against Hamilton Academical FC, the club wishes to advise that players Danny Swanson and Richard Foster have been suspended pending a full and thorough investigation into the matter. "The club also wishes to make it clear that, contrary to some reports, no player or member of staff has been spoken to or interviewed by Police Scotland." It looked like the visitors would hold out for the point until Alex D'Acol fired in a 90th-minute winner to take the home side off the bottom of the Ladbrokes Premiership table. 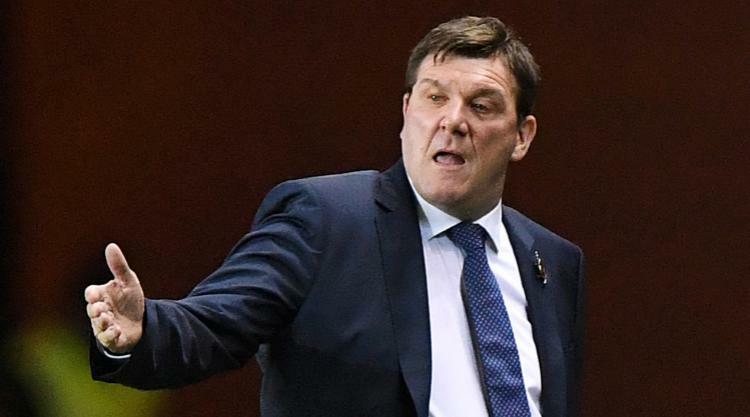 Saints manager Tommy Wright said afterwards: ''Until I have seen it, I can't really comment, but I have told the players in front of the rest that the club will investigate it. ''They have been told that if what is alleged to have happened, happened, I will and the club will come down on them as hard as we legally can. ''The players know that I won't show them any sympathy if what is alleged to have happened, happened. ''The players will be dealt with in the strongest possible way we can. ''The players have shaken hands and they have been really foolish and are probably embarrassed. ''Whether they had grievance on the pitch, it should have waited until they got into the dressing room. ''They cost us three points and we nearly got a point out of a magnificent performance from the nine that stayed on the pitch. D'Acol's strike from a Danny Redmond pass took Hamilton two points above Inverness. Boss Martin Canning described it as ''one of those days when everything that could have happened actually happened''. ''I realised something was going on and myself and Boozy (Beuzelin) headed on to the park to make sure our players were not getting involved. Myself and Boozy both said to the referee that is two red cards because it was a fight on the pitch. ''Their players have taken exception to Boozy speaking to the referee and expressing that opinion, just as I was going to do. Boozy was then sent off and it turned into a bit of a mess. ''It's not what you want to see. We shouldn't be seeing that on the pitch - it's about the football. ''I haven't spoken to Tommy, but that's for St Johnstone to deal with. ''I think the other way around, everyone would do the exact same things. I was really pleased our players kept away from it and didn't get involved. ''For us, it was a huge three points. Our form at home of late has been pretty good and we now need to start picking up points on the road.